This movie hasn’t seen the light of day for many, many years but is now available on DVD. It is also dubbed into English, from its original Italian dialogue, although it has to be said that the print isn’t exactly top quality. As for the film itself, it was awarded an “X” certificate in the UK upon its original release in the 1950’s. Its central theme involves the main character (Eleanora Rossi Drago) attempting to seek out her missing sister (Liliana Gerace) in the cities of Turin and Genoa. It tackles the subject of prostitution, without actually using the word, and that is obviously why it was given an adults only rating, upon its release. 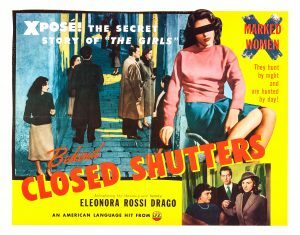 Watching “Behind Closed Shuters” now, there’s no getting away from the fact that it is rather dated, and its pace is quite labourious. However, the most memorable features involve the characterisations, as the people you will see in this movie are amongst the strangest looking individuals ever consigned to film. It also manages to convey an atmosphere of foreboding befitting its storyline, which is also helped along by fine performances from Drago and Gerace. Overall, it is quite a striking film despite its obvious flaws.